Canberra’s Mount Majura wine will join the exploding pet nat scene next week with the release of NINO (nothing in, nothing out) at a rugby charity dinner. Winemaker Frank van der Loo says ‘100% of the proceeds from this wine will go to YouthCARE Canberra’. The organisation provides outreach services to young people facing homelessness and violence. 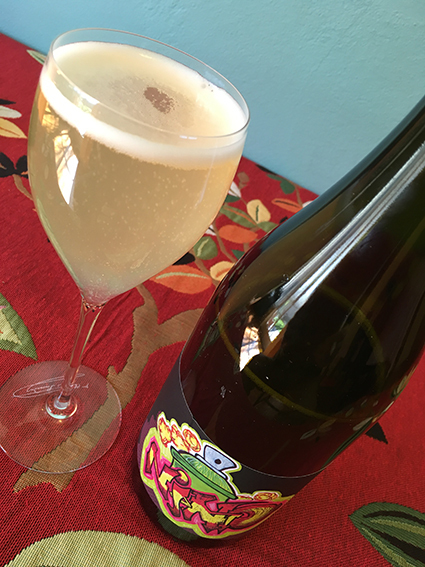 As the name suggests, the pinot-gris-based bubbly from the 2016 vintage comes about as completely free of winemaker inputs as it gets: no additives, no disgorgement, and a spontaneous fermentation. Towards the end of its fermentation van der Loo chilled the wine to reduce the amount of sediment, then transferred it to bottles, where the remaining yeast consumed the residual grape sugar, producing carbon dioxide gas – the bubbles that escape when you open the bottle. Van der Loo says this process ‘leaves a light sediment in the bottle, and this yeast takes the place of the preservative. We recommend chilling it upright and serving carefully. The last glass is for the Cooper’s drinker’. The Chateau Shanahan bottle, chilled upright overnight, opened politely as we prised the crown seal away – no bang or spray. It poured a pale lemon colour, with a light haze, steady stream of bubbles and persistent white foam. Fresh, lively and medium bodied, with a pleasantly tart, dry finish and modest 11% alcohol content, NINO offers good fun and pleasant drinking with or without food. Tuesday 30 August 2016, Hotel Realm, 18 National Circuit Barton ACT, at the Farewell to Stephen Moore Rugby Dinner. Ainslie Cellars, Jim Murphy’s Market and Airport Cellars, Mount Majura cellar door.